HMNZS Resolution is the tenth naval vessel to carry this name. The most famous was HMS Resolution under the command of Captain James Cook that he took on his second voyage and his third ill-starred voyage. It was appropriate to use a ship’s name that reflected the significance of Cook in New Zealand’s naval heritage when the RNZN went to commission a new survey and oceanographic vessel. The ship’s badge was designed by Gregor Macauley, the winner of a fleet wide competition. The six pointed star [estoile] was on the coat-of-arms presented posthumously to Cook after his death. The colours represent the blue, white, and red of the Royal Naval Ensign flown by Cook which is also the same colours as the RNZN White Ensign. She was handed over to the RNZN at Halter Marine, Moss Point in September 1996 at a cost of NZ$12 million paid on 3 October 1996. As she had been laid up for two years, four months were taken up with getting the ship ready for its voyage to New Zealand. On 13 February 1997 at Portland, Oregon she was commissioned into service with the RNZN as HMNZS Resolution. She arrived in March 1997 and the conversion at HMNZS Philomel began in July 1997 and finished in January 1998. The project to fit new equipment, a survey motor boat and conversion came to NZ$31 million. This included making the junior rates mess and accommodate more comfortable than the spartan appearance of the USN vessel when received. Initially she was painted white as all survey vessels had been but in 2000 she was painted the same grey as the rest of the fleet. She underwent trials during February-May 1998. It was expected that the RNZN would have twenty years of service from Resolution. In February 1998 as part of Operation SHOP WINDOW, she embarked the CDF and MOD personnel for a day at sea. When she first arrived the RNZN fleet considered her as Manawanui on steroids. She was equipped with commercial off-the-shelf equipment such as a multi-beam echo sounder allowing a wide picture of the contours of the sea bed being surveyed. Technology was also installed to allow surveying to be conducted in rough weather without affecting accuracy. During her service with the RNZN, Resolution’s [hereafter RES] main task has been carrying surveying duties which, while not being the most glamorous of naval tasks, is one of the most vital for an island nation such as New Zealand. Reading of her Reports of Proceedings shows month after month of testing equipment and undertaking surveys. Below are some highlights from her service beyond the usual hydrographic tasks such a ship would carry out. For example, her MBES could cover a swath width of up to 6km in 1000m water depth and was capable of operating in depths of up to 5000m. There was also the capability with the Hydrosweep to carry out sidescan and depth contouring functions. The 30khz Hydrosweep MD-2 provided a combination of sidescan and depth contouring functions so that the seabed could be mapped accurately. The transducers for the MBES were located in an underkeel pod fixed to a strut 1.5m extended below the keel to keep the array isolated from flow noise around the ship’s hull. During her first year of service she tested her equipment but also carried training of junior officers, fisheries patrols, SAS exercises and undertook a diplomatic visit to Tonga. This included SOPAC ’98 her first operational deployment overseas in June 1998. There was a rededication ceremony held on 27 November 1998. The towed array system was first fitted to HMNZS Tui in 1989 and operated from her until she paid off. The system was then reactivated and fitted to RES in 1998 in support of DTA (then DOTSE) trials, and RNZN training and exercise commitments. RES MPE lines were multi rolled, when doing LINZ work H trade manned the ship, then switch out for Towed Array the sonar trade would take over the para lines. The system was last used during TASMANEX 01. The FMS 15/2 system was removed from service in 2002 and subsequently removed from RES. In 1999 she undertook her first major survey. She was sent to Stewart Island to survey the coast as well as Foveaux Strait. This took over six months through the difficult sea and weather conditions in that part of the world. RES’s tasks once she had settled into the RNZN fleet included defence oceanographic research carried out on behalf of the Defence Operational Technology Scientific Establishment [DOTSA] Staff studying New Zealand’s oceanic regions. In August 1999 she undertook a towed array survey in the Kermadec Trench. It was also during this period that she was fitted with bilge keels to assist in slowing the heaving and rolling motions and create additional hull dampening. In October 1999 under contract to LINZ, RES undertook a survey of the Northern Shipping Routes. On 3 November 1999 RES used its RHIB to shuttle diesel fuel to a fishing vessel out of fuel and in distress off North Cape in moderate to rough conditions. 1999 was a steep learning curve for the ship’s officers and ratings using the MBES, conducting its first contracted survey and the five month deployment to Stewart Island. The Commanding Officer was able to report he was proud of the ship’s achievements and that of its company. In January 2000 more survey was carried out on the shipping routes and the SMB Adventure was tested with its own MBES fitted. In March 2000 RES had the rare privilege of conducting OOW manoeuvres with the frigate HMNZS Canterbury. RES had the role of guide and continued sounding a dual survey/operations role that was probably a ‘first’ for the RNZN. The final surveys were carried out for the season in April 2000 given that the late autumn and winter months were too rough for proper surveying to be carried out around the New Zealand coastline. In May 2000 RES went into drydock and had her mast replaced and bilge keel and hull work completed and was out of dock by the end of May. In June Adventure undertook survey work of Oamaru. In July 2000 she was tasked with survey deployments in the Pacific Islands. For this deployment she was under the command of Commander A.G.A Watts who handed back command to Commander C.A. Holmes on the return to New Zealand. The first task was a towed survey of the Kermadec trench. Some equipment problems were solved by a RNZAF Orion dropping a canister with the parts required that was recovered by the ship’s RHIB. During this operation, RES got a call to proceed to South Minerva Reef and render assistance to a yachtsman who had been injured aboard the yacht Donella. Upon arrival on 14 July, a LMA was boarded and rendered medical treatment for a shark attack injury. The patient was returned to the ship and RES proceeded to Nuku’alofa. After leaving harbour, work was undertaken for the DOTSA. She then preceded to Port Vila for the Vanuatu independence celebrations. After leaving Port Vila she returned to Auckland. In August 2000 the survey tasks off New Zealand were resumed. Data blocks that were being sent through to the Hydrographic Business Unit were of 10x5nm in size. In October, surveys were undertaken of the wrecks of HMS Puriri, a minesweeper sunk in May 1941 and the SS Niagara sunk in 1940 by a German mine. A cabin was also damaged by a fire. In November RES undertook a month-long survey of Shipping Lane Two in the Cook Strait. After leaving Auckland, RES returned to Cook Strait to continue the survey through late Janaury and into February. Most ships complied with the rules avoiding a survey vessel but some problems were experienced with smaller craft. Taking a break from the survey, RES visited Napier as part of the Art Deco weekend and to mark the 70th anniversary of the Napier Earthquake and the part played by the navy in the rescues and recovery. The following weekend, the ship paid its first visit to New Plymouth. The ship then returned to survey duties. In March the Cook Strait survey was continued and then the ship deployed to TASMANEX 01. The role of RES was to deploy her towed array and she had changed out her hydrographic team for the array team. During this exercise, she was boarded by a party from HMAS Melbourne. The next day the ship acted as a fishing boat and was boarded by parties from HMNZS Te Mana and the French naval vessel FNS La Moqueuse. She was then released from the exercise and sent south to resume the survey. On arrival at Wellington Commander Holmes handed over command to Commander C.J.A Hoey. Surveys continued in April until the ship returned to Auckland. The next survey plan was along the Wairarapa Coast from Cape Kidnappers to Cape Turnagain again looking at shipping lanes. During this operation the small boat Avon broached on passing through surf without any injuries to the party onboard. The survey finished in early May. It was also in this month that the RNZN advised it would no longer maintain or pursue a towed array capability. In July, RES proceeded to Raoul Island conducting a stores and personnel transfer. Due to weather conditions, it had to wait three days standing off the island before the seven personnel and stores could be safely landed by the RHIB. It then returned for pilotage training with HMNZS Kahu and then back to Auckland to have the FS20 Fansweep MBES fitted. Command was handed back to Commander Holmes. Members of the ship’s company who qualified were awarded their East Timor Medal. In September, the ship undertook its first visit to Australia. Trials of the MBES showed that the FS20 Fansweep had been damaged on installation but it was fixed. The next task as new to the ship since it had been commissioned. The ship’s company had to practice coming to a buoy for its visit to Sydney where it would be anchored at a buoy in the harbour. Despite the terrorist attacks on 11 September, RES was ordered to Sydney to carry out passage sounding training and participation in the RAN Navy Week, this being the RAN’s 90th anniversary. The Centenary Naval Review had been cancelled as a result of the terrorist attacks but the Navy Week was continued as planned as the fleet of vessels had arrived. Rough weather caused a few minor damages including a port-side scuttle being blown in. Upon arrival the ship and its company recovered from the passage then joined HMNZS Canterbury alongside. Other ships in Sydney at this time included RSS Persistence, HMTS Naresuan & Cha Phray, PLA-N Yichang & Taichang, INS Jyoti & Mumbai and HMS Northumberland. The RAN contingent included HMAS Melbourne, Kanimbla, Brisbane, Melville, Sydney, Waller, and Farcomb. This fleet was joined by the FNS de la Frégate Vendemiaire. On 5 October the ship left Sydney to return to New Zealand. Approaching home, a call was made to the ship to render assistance to a yacht NW off Three Kings Islands. The yacht Aladdin Steel was located and two members of the ship’s company took over the yacht from the exhausted crew and sailed it to Mangonui while RES proceeded to Auckland. After some maintenance, a new survey season was begun in the Hauraki Gulf. SMB Adventure also undertook a beach survey at Army Bay for HQJNZF. Later the Singaporean ship RSS Persistence undertook landing training there. In November the Government’s Hydrographic review team visited the ship to see RES’s hydrographic survey standards. On 15 November, a sunken yacht was pinpointed by the survey gear of the ship and marked with a buoy. HMNZS Kahu with the ODT team arrived to take over the search for a missing crew member. During the month a Gravimeter was also installed. The vision statement from the Nx work was voted as “Looking Good – Sounding Great”. On 27 January, RES was part of the starting group for the Volvo Round the World Race. After reaching the start point, RES had HMNZS Hinau berth alongside so that it could act as a transfer for the Commodore’s Barge that brought out the Governor General Dame Silva Cartwright and MCC Commodore David Ledson. The guests were entertained in a marquee on the Avon deck. On 21 Janaury Lieutenant Commander N.T.S. Quinn assumed command from Commander Holmes. In February a presentation was made to RES for its rescue in July 2001. February was marked with a return to surveying duties in the Hauraki Gulf. In April an eight week survey was begun shipping lanes around North Cape. During this time RES was tasked by LINZ to chart Cobra Rock east of Whitianga. This six metre pinnacle supposedly rose from 70m below sea level and had been charted in 1968. Despite a search of 8nm square no such rock was found. In May, while the ship was in Colville Channel, Seasprite 01 took images of the VERTREP deck and practiced approaches to RES. This was the first time it had exercised with a RNZN helicopter. This period was also marked by technical problems with the survey equipment that impacted on the survey tasks. In June, a weather bomb hit Auckland, preventing the ship from getting to DNB. It remained in the lee of Motutapu and Rakino islands running a small racetrack. Later on an anchorage was attempted with the ship’s two anchors, the first time it had been done. On 14 June command was passed to Commander W.G. Craig. The first part of July was spent doing Operation RUPERT where Police, Red Cross, Customs and MAF were embarked and disembarked using the RHIB. HMNZS Canterbury also assisted. RES departed for Sydney on 15 July, arriving 20 July. On 23 July the ship took passage to the RAN training area at Jervis Bay off the coast of NSW. Aboard ship were RNZN & RAN MCM personnel as well as DTA & DSTO staff. Surveys of dummy minefields and swept approaches were made and MCM side-scan survey. After four days of exercises the ship proceeded to Brisbane. Off Brisbane she conducted DTA trials with sonar buoys. On 17 August she dressed ship for the commissioning of the Anzac-class frigate HMAS Stuart. She then proceeded to Lord Howe Island and received the RHIB belonging to HMNZS Te Mana that had been used by HMS Nottingham when she got stuck on the reef off the island. She then returned to Auckland where she went into drydock to have the Fansweep repaired which was successfully done. In September the SAS successfully tested embarking and disembarking their RHIB from the ship. The Fansweep system was successfully bedded in and working properly. October was taken up with surveys for LINZ in the Hauraki Gulf. A toxic gas leak forced the total evacuation of the ship on 21 October. Further surveys of the Gulf were undertaken in November plus a necessary refurbishment of the ship. At Divisions in January, five of the ship’s company were awarded medals for their service and the ship won the Chatham Rose Bowl. This was a pleasant surprise as it was always thought that this award favoured the combatant ships in the fleet. On 27 January the ship was the guard ship for the Auckland Anniversary Regatta. The Governor General Dame Silva Cartwright, Minister of Defence Mark Burton and DCN Commodore M J Wardlaw were embarked from DNB to the anchorage and lunch was given on the Avon deck under a marquee. The first survey was begun the next day in the Gulf. In February further surveys were undertaken in the Gulf and Colville Channel and once again RES represented the Navy at the Napier Art Deco weekend. March was a continuation of the survey of the Gulf and Colville Channel. During this survey a diver was rescued who had lost contact with his boat that was drifting away. April continued the long process of surveying the Gulf and Colville Channel. In May, RES hosted the RAN hydrographic vessel HMAS Melville at DNB. Further surveys were carried out in June and by the end of the month RES had completed its contract with LINZ for the 2002-3 year. July continued with surveys in Jellicoe Channel. On the early morning of 4 July the ship had a real man overboard and the member of the ship’s company was recovered within 20 minutes by the RHIB and taken ashore. The Coxswain was awarded a CO’s Commendation. While in drydock in July the stern towed array level winding gear was removed as well as the after tower control electronics by a US contractor. In August the survey programme shifted to the Barrier Link and Bream Tail areas. RES was sent to Marsden Point to survey the entrance to check that the current charts were accurate and not responsible for the groundings of two large tankers. The ship was able to confirm a change to the hydrographic chart but that it was not responsible for the groundings. During VERTREP training the helicopter’s winch failed leaving RES personnel on the helicopter and the MOET team on ship. This had to be resolved with some quick assistance from Philomel, a drive to Murrays Bay and a RHIB transfer. In September the survey of the Bream Tail area was completed and the ship returned to DNB. She also took part in a boarding exercise with HMNZS Te Kaha under the name MV Wormwood. Upon return to DNB she went into a DSRA period this continued through into October. The Towed Array Tower and winding gear was removed for scrap. The quarterdeck was refurbished and changed in appearance along with a complete repaint. A new system SWAN was installed and new fire alarms. November continued the DSRA period but the ship moved out of drydock as the new control and monitoring systems were installed. The ship spent the rest of November and December alongside finishing off the DSRA period and the Lloyds survey. On January 26 2004, RES again acted as the Guardship for the Auckland Anniversary Regatta. The Governor General Dame Silva Cartwright and DCM Commodore D V Anson where hosted aboard for the day. A fridge in the galley collapsed and through quick thinking desserts were prepared for the guests. In February surveys were undertaken of Bream Bay and the approaches to Whangarei. Again, RES represented the RNZN at the Napier Art Deco Weekend. It was during this month that the ship had its sole Hands to Bathe for 2004. In March the ship continued on with survey of Bream Bay and the approaches to Whangarei. During this time MOD staff and the Crown Monitoring Advisory Group visited the ship to compare its duties with those of Tangaroa. The impression is from the ROP that the ship’s CO gave the group a very clear idea of what the ship did and its value to NZ hydrography. At this time RES did sail in company with HMAS Manoora only to be embarrassed when an engine failed. While of Whangarei the fairway buoys were accurately positioned in a good demonstration of boatwork. On 16 March Acting Commander D.L. Mundy took over command from W.G. Craig at DNB. The ship then returned to survey in the northern Hauraki Gulf. On the way to the survey grounds, RES undertook two hours of OOW manoeuvres with HMAS Success. On 26 March the bulk of LINZ Shipping Area Lane 1 had been completed. Something that had been begun in 1999 with the MBSE systems installed on RES. A survey was also undertaken of the wreck of the Waikato which was found to have broken in two around the vicinity of the turret. In April, survey was undertaken of the approaches to Tauranga which continued into May. One of the few changes was a survey of the tidal regime requested by LINZ. This required RES to establish a land base with gauges to measure the tides for a 30 day period. During this time the MCC chose to visit the ship and the RHIB was faulty, requiring the use of Avon to take the senior officer back to Tauranga. The ship returned to DNB for IMAV that went through to June. In July, RES spent two weeks company with HMNZS Kahu undertaking OOW training [Operation PANDORA] then returned to Tauranga for continuation of the survey. This operation showed that RES was an ideal platform for OOW training and had the equipment to monitor the training. August continued the survey of Tauranga including determining that Penguin Shoal had a slightly deeper least depth than on the chart. This was good as LINZ was renegotiating the MoU with RNZN over the use of RES. In September RES returned to conclude the survey of Shipping Lane 1 for LINZ and to undertake a survey of the Wairarapa coast after a three year absence. Upon departing there was a small fire caused by poor maintenance undertaken earlier in the ship’s commission. Beginning off Tauranga the final parts of the survey were done meaning that over five years 20,000nm of Shipping Lane 1 had been surveyed which was a task that had taken over five years. The next job was to resume survey of shipping lane 2 from the Wairarapa Coast to Kaikoura, a triangular area of 1412nm. After some work the ship proceeded to Wellington. During this period the “big dog” the deep water MD2/30 MBES was brought into use for the first time in three years. Further rough weather prevented much surveying and the ship returned to Wellington. October was taken up with surveying in Shipping Lane 2. A shore party had a car accident in their 4WD but there were no injuries. The ship then proceeded to Wellington and went into port in company with HMNZS Canterbury. While in Wellington the DTA loaded aboard a 20ft container that was a portable laboratory for use with Multiple Influence Signature trials due in November. Also at Wellington the first woman AHSO was promoted to Leading Hand. After leaving Wellington, the ship surveyed the wreck of the Second World War auxiliary minesweeper South Seas and went back to Shipping lane 2 for survey work. ON 28 October the ship broke off and headed to Picton. RES would be the first time a RNZN major fleet unit had visited Picton since 1998. She had entered via the Tory Channel. In November, RES left Picton and proceeded to Pelorus Sound to undertake Multiple Influence Signature ranging as a trial for DTA. DTA staff worked alongside RNZN personnel to conduct the trial as buoys was deployed. The trial was a success. The DTA staff was left at Picton and the ship returned to survey duties. This was broken off and a trip made to Nelson. Surveying was resumed but bad weather brought the ship back to Wellington. In December the ship returned to DNB. During the Fleet Tabloid Sports, the ship’s company won the Comradeship award. Janaury was spent in IMAV. In February as the ship prepared to return to sea duties, she rescued a boat in Auckland harbour drifting near Bean Rock. The RHIB was sent and took the boat to the Orakei Marina. A small sounding skiff Dirk was loaded on ship alongside SMB Adventure. A Detached Geospatial Support Unit based at JGSF was embarked. 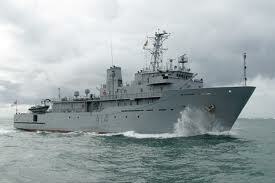 On the 14th the ship departed to take part in TASMANEX 05 in company with HMNZS Manawanui & Kahu. This was only brief. While in the Gulf an offer from HMAS Melville joined the ship along with Customs and Immigration staff. Both ships then departed in company to begin exercises starting with a minefield transit. Both ships then undertook advance force operations for an amphibious operation by surveying landing sites. After the training the two ships were joined in Napier joined by Manawanui after her repairs. At Napier the ships took part in the Art Deco Weekend with RES & Manawanui as representatives of RNZN. After the weekend, both ships resumed TASMANEX tasks. the DGSU and ODT used Adventure to conduct beach surveys. After the conclusion of the tasks, the ship departed and RES resumed surveying. In March the ship continued surveying of shipping lane 2 and made two visits to Wellington. During this month RES hosted Ocean Survey 20/20 with the Minister of Defence aboard. While at sea RES encountered Canterbury as she was heading north to be decommissioned. RES did a haka in response to the frigate’s fly by. In April RES took part in Operation CALYPSO and visited Tonga, Samoa and Fiji. She took a second RHIB and the DTA TRANZLAB container for this deployment. The first port was Nuku’alofa. The next stop was Apia and where the SMB would do inshore surveys. A survey team was sent off for ADVFOROP and Dirk, the TRANZLAB were landed to process the data collected. This group would be recollected on the passage back to NZ. RES then departed for Suva. The 90th anniversary of ANZAC day was observed at sea. This was the first visit to Suva by a RNZN vessel in five years. RES then departed for Rarotonga. In May, RES reach Rarotonga and berthed at Avatiu Port. Three tonnes of relief supplies were embarked and taken to Pukapuka Atoll which had been hit by cyclones. At the atoll RES did a survey updating the poor chart and the supplies were landed. RES personnel went ashore and cleaned up and help in necessary repairs. RES then departed for Tokelau. RES personnel went ashore to provide technical support for the island’s infrastructure. During the night the island of Nukunonu was surveyed to a modern standard. RES then returned to Apia. All equipment that had been landed was re-embarked. From Apia RES went to take part in Operation TROPIC TWILIGHT 05 at Niue. RES was supposed to work with Army engineers. As they were late, RES personnel went ashore and helped rebuild & repair government buildings and the airport. A survey was also undertaken of Alofi Harbour to update the charts. RES left for NZ on 22 May. In June RES took part in Operation ACHILLE LAURO 05 and OOW training. Initially the training was in company with Manawanui and was later joined by Kahu. The next task was to act as support for the SAS Maritime Counter Terrorism exercise which included daytime and nightime boarding exercises and helicopter landings. The exercise was carried out on the northern side of the Whangaparaoa Peninsula. A RNZAF helicopter took part as well as the SAS RHIB. At the end of June the northern section of shipping lane 2 was completed and handed to LINZ. In July RES returned to Cook Strait for DTA tasking and survey operations. On return to Wellington the TRANZLAB was landed and the survey commenced and this was continued into August. During this month, RES made its first visit to Lyttleton in seven years. After a brief visit the ship returned to survey duties. In October, RES conducted operations with the RAB MCM vessels and celebrated the bicentennial of Trafalgar at Nelson on 21 October. The MCM work was conducted in the Marlborough Sounds with HMAS Yarra & Hawkesbury. One feature was rafting of the three vessels showing that as RES was bigger what support it could give to the MCM vessels. RES returned to Wellington. She next left and met up with HMNZS Endeavour and HMAS Stuart. RES personnel went ashore a cleaned Cook’s memorial at Ship Cove. On 21 October RES and END with eight other RNZN vessels were in Nelson Harbour for the bicentennial. A charter parade was held the next day. RES then left for Auckland ending the programmed sea-time for the year. November was spent alongside DNB. December 2005 and Janaury 2006 were leave period and maintenance with equipment training and trials in the Hauraki Gulf. At the 2005 Navy sports day RES won the Courage Trophy. In February RES commenced Operation ACHERON – surveying tasks for LINZ in the Bay of Plenty and took part at the Art Deco Weekend in Napier as the RNZN representative for the 75th anniversary of the Napier earthquake. She was accompanied by HMNZS Moa & Hinau. Survey work followed and RES returned to Napier with HMNZS Wakakura & Kahu. In March operation ACHRON continued broken by a visit to Napier and Tauranga. This time was marked with serious issues with the two RHIBs. She returned to Auckland at the end of the month. In April, RES was deployed to New Caledonia for Operation CRIOX du SUD (Southern Cross) and made her first visit to Noumea. One of the first things that had to be done was to get the Force Protection training up to scratch. She arrived on 21 April for the exercise. RES formed an amphibious task group with HMAS Manoora and the LSL HMAS Tobruk. New survey equipment was fitted to Dirk and single beam echosounder. With the MCC aboard, RES joined with the other ships to form TG PHOTEX this included the FN vessel Vendemiaire. The exercise took place off Canala Bay and Dirk was sent to collect data for the task force including beach profiles. RES surveyed a safe anchorage area. With the survey complete, RES XO then briefed the TF commanders. He was taken by a FN Puma. The second task was a non-combatant evacuation operation. A survey was undertaken for a safe route by Houailou. In May RES completed the exercise and then had a Mission readiness evaluation and returned to LINZ surveying tasks. The first days of May was acting with the TF in landing exercises. The FNS Jaques Cartier was present. RES was detached when her task was completed then sent to do the MRE. One of the things learned was the need for an organic survey vessel for the MRV if operating in ports that are poorly charted. RES returned to Auckland on 11 May. Then RES went to conduct surveys at Shipping Lane 4 Tauranga to Napier after a PAL. In June RES continued her survey for LINZ. As the request of the Royal Society, RES was detached and took a party of eight schoolchildren to the Chatham Islands for an educational programme. RES spent four days there and returned with the party to Auckland. Some of RES personnel went ashore and painted the school rooms. For most of July and August RES was in a maintenance period. At the end of August RES resumed survey operations in the Bay of Plenty for LINZ. In September, the survey tasks were carried out marked by a brief visit to Tauranga and a return to Auckland at the end of the month. In October the survey was continued and RES visited Gisborne. A ceremony was held there to mark the centenary of the memorial to the first meeting of Cook and the local iwi. RES departed Gisborne and returned to the Hauraki Gulf to meet up with all five IPCs to conduct OOWMAN serials and BOARDEX. RES then went to the Bay of Islands and called at Opua wharf another first for the ship. RES then departed to conduct a survey of Poor Knights Island group for DOC. Dirk was loaded for this task. The survey found that the charts were incorrect and there was about a one cable error in the charts and the marine reserve limits. Then RES returned to DNB for maintenance. November returned to surveying for LINZ with visits to Wellington and Napier. Morale on the ship was improved with the installation of satellite television. RES assisted in the Year of the Veteran celebrations. She then went to survey Hawkes Bay. During this she identified the location of SS Tasmania sunk in 1897 for the official chart. During the month RES supplied logistics and ceremonial support to the rededication of the memorial at Ship Cove at the request of DOC. She also acted as transport for the VIPs from Picton to Wellington. She finished off with more survey. December began with RES in Napier then she returned to Auckland. On 13 December command was passed to Commander M R Tuffin. At Champion of the Navy, RES won the comradeship prize. The ship went into lock down. At Divisions in Janaury, RES was awarded the Chatham Rose Bowl for most efficient ship and the Fleet Efficiency Pennant. The rest of the month was taken up with survey of shipping lanes off Napier. During February, two 10-day survey tasks were completed for LINZ and a visit to Tauranga. ON 1 February the ship’s company took the tot at the pleasure of the Governor General in recognition of the turnout at Divisions in January. On 3 February RES went to the assistance of a fishing boat in trouble. A salvage party and pump was sent and the boat’s flooding stabilised and it was escorted to Napier harbour. RES also berthed at Napier for the participation in the Art Deco Weekend and the Napier Earthquake commemorations. March saw the last survey task for LINZ for the financial year. The month began with a visit to Nelson. The next task was co-hosting the Major Fleet Unit Navigating Officer’s course with HMNZS Te Kaha. With the CN aboard RES the students began the course at Picton. Other training was undertaken in the Sounds and she returned to Wellington. The next deployment was a resupply to Raoul Island for DOC, Operation HAVRE. A container of stores and fourteen personnel were loaded for the trip which included the rare sight of a pod of sperm whales on the surface re-oxygenating after deep dives around the Kermadecs. In rough conditions the XI and LMED were landed to give first aid to one of the party. Some survey work was carried out including rapid capture of data in the Rapid Environmental Assessment context. One rock of interest to GNS was located and mapped by RES. RES departed for return to DNB. On the way back what was thought to be space debris was spotted and the ship undertook a search. In April RES did ranging work with DTA and REA development. This led to Operation ACME an ADVFOROPS with the DHSU and MCM team. It was carried out in Doubtless Bay. During the exercise the REMUS was aboard and under evaluation for addition to the ship’s equipment. Rapid data capture and display was also worked on. RES then went to New Plymouth. From there the ship went back to the Sounds for beach survey training and then on to Picton. From Picton RES returned to DNB. May and June were spent in a maintenance period at DNB. In July RES recommended Operation ACHERON for LINZ and revisited Napier. While in DNB RES was a platform for CTTAG training using magnetic clamps to bring boats alongside. During a storm in Auckland harbour RES narrowly missed a barge dragging at anchor at night across the Rangitoto Channel. The next two tasks were a survey and Operation TORCH 01/07 support to the Governor General in his visit to the Tokelau. MFAT stores were carried for Raoul Island and Tokelau. The first stop was offloading supplies to Raoul Island. RES then went to Apia to embark the Governor General. Eleven RES sailors had to be offloaded for the official party to have accommodation. On arrival, RES conducted a survey of Atafu Atoll. In August, the next island visited was Nukunonu which had been surveyed in 2005. The last atoll Fakaofo was given a full survey. At all islands, stores and working parties were sent ashore along with the Governor General. After this visit RES returned to Apia and took back the shore party that had worked for the Red Cross in August and Lt Cdr Spencer took over temporary command. RES took passage back to DNB and on the way did some survey work north of Raoul Island and disprove DOC belief that these were shallow areas. It stood off the Island to take a 17-person party back to DOC Auckland. During this deployment, the ship’s company was the first to use the new GWD both in a winter and tropical environment. At the end of August, RES went to the survey area for LINZ to resume its task. In September RES undertook surveying tasks and made a visit to Tauranga and Napier plus one unscheduled visit to Napier when the weather was too rough to survey. The visit to Tauranga was done in company with HMNZS Wakakura, Kahu and Kiwi. New software was introduced for a ship intranet and morale software included that allowed the CO to report the morale was at 75%. October continued with more surveying for 23 days and visits to Napier, Gisborne and Te Unga Mai for the Cook arrival commemorations. Entering Gisborne, the ship was provided with an automated swell and war prediction chart that proved excellent for berthing the ship. November was spent at DNB following the completion of the LINZ surveying in IMAV. December and early January 2008 was spent in DNB working up from the IMAV. This was because of the vast amount of replacement and refurbishment of the ship’s interior and equipment. RES returned to operational status at the end of January. Most of April was spent alongside DNB. While at Gisborne for ANZAC Day, the ship suffered damage at the berth and had to have extra hawsers laid. After ANZAC day RES departed for survey duty. In May RES was off Poverty Bay conducting surveys for LINZ and visited Wellington while hosting CN overnight. Work included survey an explosives dumping ground in Cook Strait. RES stopped at Gisborne then back to DNB. June was spent in DSRA. July was spent in DSRA and limited harbour trials. In August RES conducted surveys around Great Barrier Island including a dumping ground east of the island. The Mokohinau Island group was also surveyed. Due to the steepness of the islands, the ship had to come in very close to conduct the survey. 1000 linear nm were completed in record time. A two person party was sent to Pukapuka in the Cook Islands ahead of the November 2009 survey of the island in support of Operation TROPIC TWILIGHT 2009. In October RES conducted hydrographic survey tasks in Tonga carrying over from September. RES was working in waters that had not been properly charted before with all the risks that implied but RNZN believed that the ship and its company were best equipped to handle this role. While of Nuku’alofa RES RHIB and Nor Sky helped pull a yacht off the reef and it made it to port. SMB Adventure was deployed continuously to do in-shore work. Tonga defence divers also carried out training on RES. RES boats also rescued people in trouble. In mid October, RES began the first survey of the island of Vava’u since 1898. Great care had to be taken from the risk of grounding on uncharted shoals and reefs. Most of the island at about 20-30 offshore is very steep made it a little easier. A detached team surveyed Neiafu Harbour, supposedly one of the South Pacific’s most safe harbours during the cyclone season. November was spent conducting hydrographic surveys in Tonga, Samoa, and the Cook Islands. On 1 November RES personnel helped damage control on MS Olovaha off Vava’u. and the ship returned to port. RES personnel voted in Apia for the 2008 election. Due to limited berthing, RES rafted next to FNS Vendemiaire. As RES surveyed, shore parties undertook aid work. On 14 November, RES grounded on a shoal charted at nine fathoms damaging the echo sounders. The grounding was not the fault of the CO or navigator, just poor charts. The risk from grounding was high during the days following the initial contact. Adding to the difficulties, an event had to be hosted at Apia and only after negotiation was RES allowed to berth and set up for what proved to be a successful event. The damaged MD 2-30 MBES was not replaced so the Fansweep 20 was utilised until 2010 when this was replaced by the RESON Seabat MBES 7125 (0-300m). During Lagoon MINEX 09 RES operated the REMUS. One of RES’s last tasks as a commissioned RNZN vessel was to assist in the search for those lost when the vessel Easy Rider sank off Stewart Island. HMNZS Resolution made its farewell visit to her homeport of Gisborne from 19–23 April. Several events are planned for this period including a formal Return of the Charter Parade, Cocktail Function, Open Day to the Public and Commanding Officers’ Luncheon. Commodore A.J.O. Martin RNZN Maritime Component Commander (MCC) was in Gisborne in support of this visit from 19–22 April. This was her last formal event before decommissioning. During her service in the RNZN, she has conducted surveys of shipping lanes around New Zealand under contract to Land Information NZ who is the main government agency that works with the Hydrographic service. Some of these surveys took over five years to complete given the size of the sea area to be covered. This survey work has also taken her to the Pacific Islands where in some cases the survey was the first done since the nineteenth century. She has also taken supplies and personnel back and forth from Raoul Island for DOC as well as doing some survey work as requested. Over the years Resolution has been involved in a number of humanitarian aid projects and search and rescue efforts. this included taking supplies to an isolated island in the Cook Islands group that had been struck by cyclones. Wherever possible, shore parties have been sent ashore in the Pacific Islands to offer practical assistance to the inhabitants. In March 2012 she was sent to Stewart Island to assist in the search for the sunken vessel Easy Rider and the missing crew. This is almost closing the circle on her service as Resolution’s first task as a RNZN vessel was to conduct a long survey of Stewart Island in 1999. 22 February when Christchurch struck by magnitude 6.2 earthquake. HMNZS Canterbury, Resolution Otago, & Pukaki, alongside in Lyttleton, personnel landed to provide assistance. Resolution tasked with survey of harbour. Later in October, Resolution proceeded to the PNG and the Solomon Islands. Off PNG, the ODT operating off Resolution found a Japanese Zero fighter underwater after using their AUV. Further searches by the ship found other wartime wrecks. Her last major task was Operation RENDER SAFE. This was to locate and dispose of unexploded ordnance left from the Second World War that had raged through the Solomon Islands during 1942-1943. The Royal Australian Navy also had ships deployed as part of this operation. On Mono Island, the ship’s company celebrated New Zealand Day on the island which recognised the New Zealand 8th Brigade 3rd NZ Division that had landed and cleared the island of Japanese forces. Along with celebrations, Resolution conducted surveys off Guadalcanal and located the wreck of the Japanese I-1 submarine sunk by RNZN vessels in 1943. Surveys were also conducted of Tulagi Harbour including the wreck of HMNZS Moa sunk in April 1943. During this time many wrecks and other reminders of the battle were found. This deployment included the construction of a memorial to the fallen on Vella Lavella Island. Colledge, J.J., Ships of the Royal Navy: The Complete Record of All Fighting Ships of the Royal Navy, Revised by Lt-Cdr Ben Warlow, London: Greenhill Books, 2003. J.J. Colledge, Ships of the Royal Navy: The Complete Record of All Fighting Ships of the Royal Navy, Revised by Lt-Cdr Ben Warlow, London: Greenhill Books, 2003, p. 272. EXR0018. See also J.J. Colledge, Ships of the Royal Navy: The Complete Record of All Fighting Ships of the Royal Navy, Revised by Lt-Cdr Ben Warlow, London: Greenhill Books, 2003, p. 272. The final survey charts were not finished until February 2000. Due to careless handling by the dockyard staff it was nearly ruined and would have had to been replaced. ROP December 2006 – January 2007. Email from Commanding Officer of Resolution Lieutenant-Commander Matt Wray 22 November 2011.